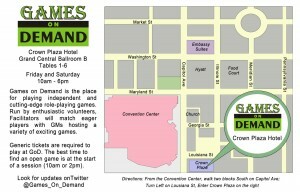 Games on Demand is back at Gen Con for 2010! The event will take place on Friday and Saturday (August 6-7) from 10am – 6pm in Grand Central Ballroom B of the Crown Plaza Hotel. Once you’re there, look for the groups of excited gamers at tables 1-6. Find the event hosts, tell them what you’re interested in playing and let them guide you to the fun. While you do not need to register for games, generic tickets are required to play at GoD. The best time to find open games is at the start of a session (10am or 2pm). You can also show up with a game ready and volunteer to run it at an open table! If you’re interested in signing up as a host or GM, contact Scott Acker or talk with one of the hosts at the event for more information. 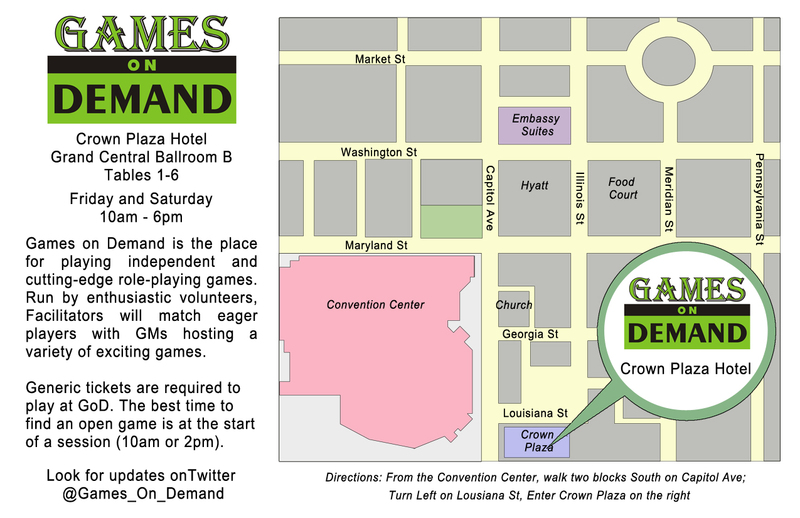 For additional updates online, watch this site and the @Games_On_Demand account on Twitter.